I have heard this quite a few times lately. Basically one small cocker is bouncing off the walls, whirling from one room to another like a small but determined tornado, and giving her family no peace. People swing wildly from believing that huge amounts of exercise will fix the problem. To believing that nothing will fix the problem. Personally I don’t believe it is necessary to exhaust a dog in order to get along with it. Let me say to begin with that working cockers are very active dogs. I have three, all now live in the house, and they all have only two speeds. Stop. And Flat Out. 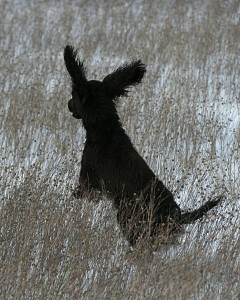 [wp_ad_camp_1]Obviously, you must provide regular exercise, training, and mental stimulation for your cocker. But whilst your dog is in the house with you, it is ok for you to set some ground rules. If you were expecting your dog to ‘walk’ around your house, you are probably very frustrated. Given a choice, cockers run and I mean RUN everywhere. Walking is an alien concept. So, if you want some peace whilst you watch T.V. or work at your computer, all you need to do, to keep your cocker happy, is to place a basket by your feet, and teach your cocker to lie in it. Have a basket in any room where you want the dog to lie quietly. I have one in my office, one in my kitchen, and one in my sitting room. Start with realistic goals. A four month old puppy should not be expected to ‘stay’ in a basket for two hours! Aim for a few minutes to begin with. You can clicker train the dog to jump into the basket, or you can lure it there with a treat. In the first week start with five seconds. Try and fit in at least half a dozen ‘stays’ in the basket every day. By the end of the first week you should be able to have built up to a minute or more. Each week raise your target, build up bit by bit until your dog can lie still for an hour. This won’t change the temperament of your dog, and it does not mean your dog will WALK to the door when you release her from her basket, but it does mean you can be ‘together’ and relaxed at the same time. 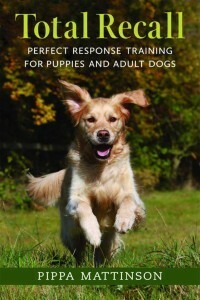 Teach your dog to obey the heel command indoors as well as out. That means you can move the dog from room to room without it bouncing off the walls, and enables you to control the dog around visitors. Start small (2 steps in the kitchen) and build up slowly, proofing carefully. My spaniels lie next to me whilst I write, but I often ask them to walk at heel to the back door when I let them out to stretch their legs. Otherwise they tend to knock everything flying in their enthusiasm to be the first out of the door! When you can’t train or supervise a young cocker, and until you have taught a ‘long stay’ in the basket, place her in a crate in a family room with a nice kong to chew, so that she is not lonely. Cockers can be very vocal. Screaming in the crate is quite common. Fortunately it is easy to teach any dog to be quiet in a crate. It works with ALL dogs. The reason it is simple is because leaving the crate and/or being able to see you, is totally under your control. Nothing can interfere. Your aim should be to have a dog that can rest in her basket whilst you are busy and between walks, and that is not disrupting the family with constant frantic activity. And that rests quietly in her crate if needs be. This is within the capability of any working cocker in any home. Provided you put the training time in. A cocker subjected to this kind of routine will quickly settle down and learn to sleep away the hours between walks and play. She will probably be a lot more content as a result of this imposed routine. I love this article. My 2 cockers (7 month worker, 3 year old show) can be hard work I’m the morning but once they have had their constitutional they are pretty chilled out for the rest of the day. It doesn’t have to be a long walk on account of the puppy. 45 minutes is enough to calm them down.